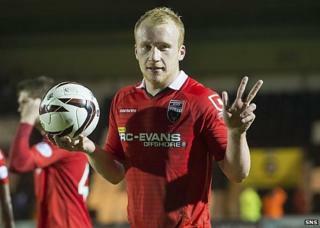 Image caption Bha trì tadhail aig Liam Boyce am Pàislig oidhche Luain is bidh trì geamaichean aig County aig an taigh eadar seo is deireadh na lìge. Bidh Ross County aig an taigh ann an trì de na còig geamaichean mu dheireadh aca, is an SPFL air na geamaichean às dèidh sgaradh na Prìomh Lìge fhoillseachadh. Cuiridh sgioba Inbhir Pheofharain fàilte air Partick Thistle, St Mirren is Hamaltan. Bidh an dà gheama air falbh aca an aghaidh Thobar na Màthar, a tha an dràsta àon àite air deireadh air County san 11mh àite san lìog, is aig Cille Mheàrnaig air an là mu dheireadh den lìog fhèin. Tha sgioba Jim Mhic an t-Saoir air sreap suas an lìog gu h-iongantach anns na seachdainnean a chaidh seachad le 25 puingean à 9 geamaichean. Feumaidh iad crìochnachadh san 10mh àite co-dhiù gus na geamaichean dearbhaidh a sheachnadh is bidh iad dòchasach leis mar a tha iad a' cluich an-dràsta gun tèid aca air sin a choileanadh. Aig ceann eile na lìge bidh Caley Thistle air falbh ann an trì de na còig geamaichean acasan is iad ag amas air àite Eòrpach a ghlèidheadh 'son a' chiad turais. Cluichidh iad Obar Dheathain ann an Inbhir Nis le geamaichean air falbh an uair sin an aghaidh St Johnstone is Dùn Dè. Tillidh iad gu tuath 'son a dhol an aghaidh Dhùn Dè United is iad a' crìochnachadh an seusain aig Parkhead an aghaidh Celtic. Feumaidh ICT grèim a chumail air an treas àite gus an t-àite Eòrpach sin fhaighinn is iad an-dràsta 6 puingean air thoiseach air Dùn Dè United ach le aon gheama a bharrachd air a chluich.